MANILA, Philippines - The National Police Commission (NAPOLCOM) opened today, February 8, 2016 the Online Exam Application Scheduling System (OLEASS) for Sunday, April 24, 2016 PNP Entrance and promotional examinations. 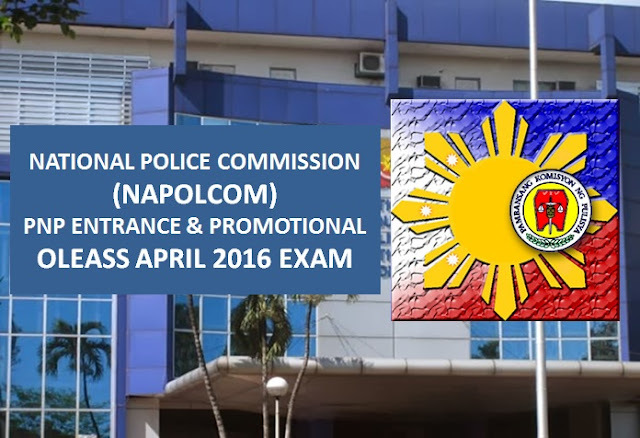 NAPOLCOM OLEASS 2016 for PNP entrance exam is available starting today at 12 noon until February 12, 2016. Go to NAPOLCOM website or direct to www.napolcom-oleass.com. The agency will activate the online application scheduling system for Police Officer exams on February 15-19. Meanwhile, it will be available for Senior Police Officer (SPO), Inspector and Superintendent on February 22-26, 2016. "In view of the resource constraints, the regional office reserves the right to limit the number of examinees it will accommodate. Acceptance of applications shall be on a "first-come, first-served basis and, upon due notice, may be stopped even ahead of the deadline," NAPOLCOM stated on its announcement. The period of filing applications is scheduled on February 29 - March 29, 2016. NAPOLCOM said that only applicants with a confirmed scheduled appointment with reference number shall be entertained. How to get scheduled appointment for filing of appication for the PNP Entrance and Promotional exam? 1. 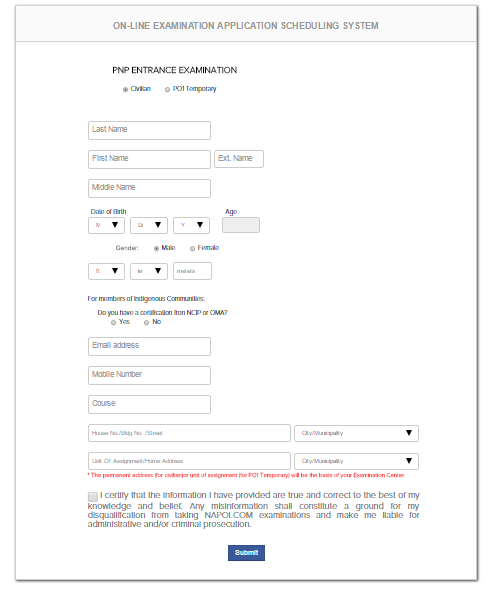 Applicant logs on the NAPOLCOM official website or direct to www.napolcom-oleass.com and fills out the ncecessary fields such as examination title, full name, address, cellphone number, email address and present rank. 2. After filling out the mandatory fields, applicant to submit form. A CONFIRMATION will appear if registration was successful. If not, the process should be repeated. 3. Press the PRINT CONFIRMATION LETTER button flashed on the screen to print the confirmation letter. Note: The examination center where the applicant shall take the promotional exam is automatically assigned by the computer system based on the home address or unit/assignment address provided by the police applicant. NAPOLCOM conducts two sets of police examinations twice a year, one for those who are already in the police service (promotional), and another for those aspiring to enter the Philippine National Police (PNP entrance). The PNP ENTRANCE EXAMINATION is open to all Filipino citizens who meet the age, height and educational requirements. The PROMOTIONAL EXAMINATIONS are open exclusively to all qualified uniformed members of the PNP who meet the minimum qualification standards for examination in terms of rank and eligibility.